Christmas bookings require a $250 deposit with payment of the balance 6 weeks prior to arrival. Easter bookings require a $250 deposit with payment of the balance 3 weeks prior to start of Easter. All other bookings require a $100 deposit or the full booking fee for weekends or if the total tariff is less than $100. Payment of the balance is due on arrival. Christmas and Easter bookings require a deposit of $250 at time of booking with balance paid prior to arrival. All other booking periods require a deposit payment of $50 for sites and $100 per cabin at time of booking with balance on arrival. 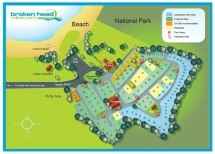 Beach House and Beach Cabins – Rates quoted are for 2 adults and 2 children. Beach Shacks – Maximum 2 guests. One night stays (All Cabins) – Only available on the day of arrival, subject to availability at managements discretion and will incur a $20 cleaning surcharge. Not available for any discounted special offers. Extra persons incur an additional nightly charge (see tariff chart for extra costs). All specials and promotions – only available for bookings made from the advertised date(s). All prices are subject to change without notice by management. In some instances your van/motorhome/tent etc. may not be able to be accommodated on the size sites actually available at the park. In these instances you will be contacted as soon as this is known and if possible you will be offered alternate dates or your booking cancelled and we will not process your deposit. Site numbers are not guaranteed. Please contact the park if you have any special requirements before your arrival. Reception closes at 6pm Monday – Thursday, 7pm Friday Saturday, 5pm Sunday. Check in after this time may be made by prior arrangement. 4pm subject to availability and incurs a $20 fee.